PHNOM PENH − With just 10 months to go before Cambodia's next general election, Prime Minister Hun Sen, who has ruled the country for more than three decades, appears to be implementing a shrewd strategy to ensure victory for his Cambodian People's Party. As election gets closer, Hun Sen has been steadily chipping away at the strength of the Cambodia National Rescue Party, the country's only opposition party, whose top leaders are either behind bars at home or in self-exile abroad. At the same time, he has been tirelessly traveling the country to court potential voters from all walks of life, including the country's 700,000-strong garment industry workforce, which was a core support base for the CNRP during the 2013 election. In that election -- the official results of which were disputed by the CNRP -- the opposition party managed to garner nearly half of over 6 million votes cast to win 55 seats in the National Assembly, against 68 for the CPP. Apparently hoping to prevent another close call, Hun Sen has been taking draconian measures against the CNRP ahead of the next election, such as instituting legal action to have it dissolved. Chheang Vanarith, a research associate at the Singapore-based Institute of Southeast Asian Studies, views some of these measures as "an overreaction to the potential threat posed by the opposition party." Among them, leading opposition figure Sam Rainsy, who has been living in self-exile since 2015, has been hit with a number of defamation and disinformation court cases, convicted of some, expelled from the National Assembly and stripped of his parliamentary immunity, while he faces arrest if he returns to Cambodia. He resigned as party leader in February after CPP lawmakers moved to amend the Law on Political Parties to dissolve any political party led by someone convicted of a crime. His longtime deputy, party cofounder Kem Sokha, took over the party's leadership earlier this year, only to be thrown into a detention center in September on treason charges. These moves have left the party essentially rudderless at a crucial time, and many CNRP parliamentarians have fled Cambodia for fear of arrest. Those who remain are keeping a low profile. Political observer Lao Mong Hay said Hun Sen has been trying to "incapacitate CNRP by decapitating it, and destroy it if it can still remain redoubtable rival in the forthcoming election." According to foreign diplomats, Hun Sen would have faced his toughest election ever if he allowed the CNRP to freely participate. To ensure his party's dominance and his own political survival, they said, he has opted to systematically silence and destabilize the opposition, despite condemnation from some quarters of the international community. From the viewpoint of the CNRP, the pressure being put on Hun Sen so far by Western countries that Cambodia used to depend on for aid has been mild and ineffectual, with the current U.S. administration of President Donald Trump paying scant attention to the country. At the same time, Cambodia has in recent years moved closer and closer to China, its top aid benefactor and investor, and a country that does not preach the virtues of democracy and human rights. According to Chheang Vanarith, Hun Sen "might have thought the Western countries are declining, particularly the United States and the liberal international order is being challenged by the Sino-centric international order." "He might view the future world order will center on China. So the Chinese model of governance might be more appropriate for Cambodia," he added. For Lao Mong Hay, the international community, especially the United States and the European Union, are "unwilling to engage forcefully for fear of confronting China, which is actively establishing Chinese hegemony in Asia, especially in Southeast Asia." Hun Sen's next step is to see the CNRP dissolved by an anticipated court ruling in mid-November, for allegedly conspiring with foreigners to topple his government. He has hinted that after its dissolution, its senior leaders would be banned from politics for five years, similar to action taken in neighboring Thailand against some politicians there. Out of fear for their political future, some CNRP members who won seats in last June's local elections -- in which the CPP won about 3.5 million voter against around 3 million won by the CNRP -- have switched sides to the ruling party. Asked recently if Cambodia will return to one-party rule after the next election, Hun Sen offered assurances that his government is committed to a policy of "liberal and multi-party democracy." He insisted that the election will be legally conducted in accordance with the Cambodia's laws and Constitution -- with or without international backing. 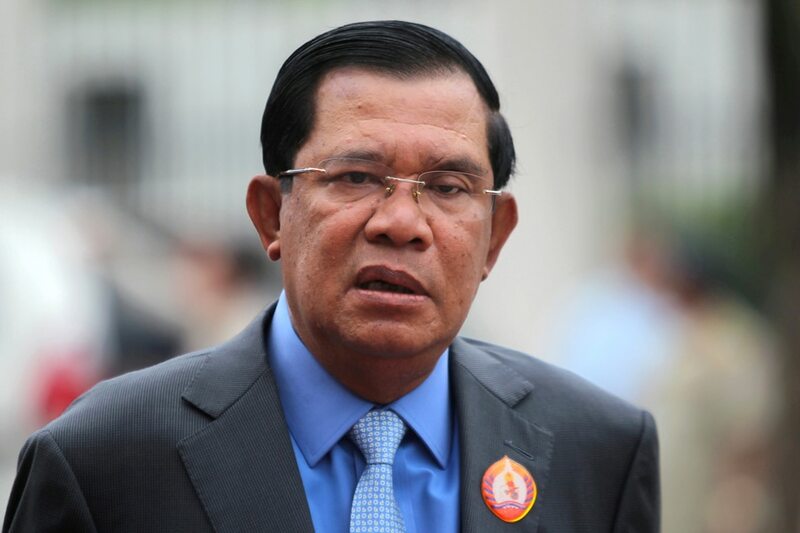 "It is enough for the legitimacy of the government as long as the election results are recognized by our Cambodian people, and it is not necessary to ask foreign countries to recognize any of our elections," he said. Despite criticism from detractors over his strong-arm rule, few would argue that the wily and charismatic leader does not deserve credit for restoring peace and stability to Cambodia, after decades of civil war and a genocide perpetrated by the Khmer Rouge. For his part, Chheang Vanarith acknowledged that Hun Sen, despite some flaws, "has built the foundation for peace and stability and socio-economic development in this country."